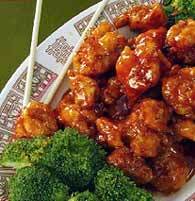 General Tsao's chicken with marinade and seasoning sauce. Mix 1/2 cup cornstarch with water. Add garlic, ginger, sugar, 1/2 cup soy sauce, vinegar, wine, chicken broth and MSG (if desired). Stir until sugar dissolves. Refrigerate until needed. In separate bowl, mix chicken, 1/4 cup soy sauce and white pepper. Stir in egg. Add 1 cup cornstarch and mix until chicken pieces are coated evenly. Add cup of vegetable oil to help separate chicken pieces. Divide chicken into small quantities and deep-fry at 350 degrees until crispy. Drain on paper towels. Place a small amount of oil in wok and heat until wok is hot. Add onions and peppers and stir-fry briefly. Stir sauce and add to wok. Place chicken in sauce and cook until sauce thickens.